Tall, strong, and built with legendary Amish handcrafted integrity, the Amish Liberty Classic Bookcase is ready to withstand the weight of all your texts, while stylishly showcasing both your knowledge and commitment to quality. Equally at home housing an antique clock in a home library, an abstract sculpture in a modern office, or rows of hefty legal documents in a law firm, this bookcase is our "classic" for a reason -- it seamlessly moves from generation to generation, without ever losing its sophistication. 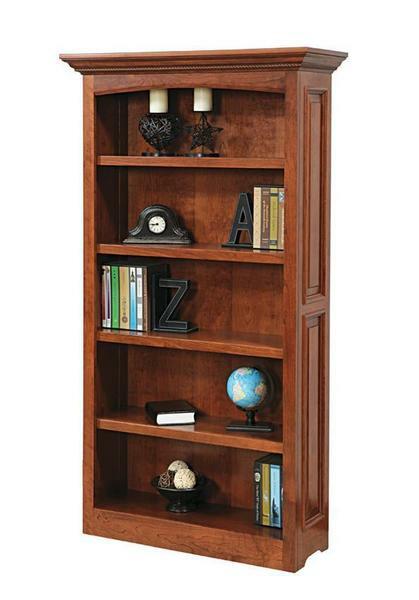 With raised panels and beautiful moulding, this Amish bookcase displays the beauty of your wood choice with charm. Select from six different wood types for this bookcase. This rich piece is right at home in your home office or library with row upon row of your favorite novels displayed. Supply your home or business office with the Liberty Classic and enjoy an essential piece of office furniture that will serve you well. With a 1" solid hardwood top and touch lighting to illuminate the contents, this Amish bookcase will be a joy to use. Take a look at the Amish Lincoln Executive Desk to use with this bookcase. Call us today, toll-free at 866-272-6773 with any questions. We are always happy to hear from you.